The news has been all abuzz about Russia and Crimea and the Ukraine. I can’t believe the cold war is back, and so soon too, but at least we’re not talking about the Middle East or oil wars for a hot minute. Please, for the love of geography and a good joke, let there be an actual “Crimea River” somewhere on the map. This is the second year in a row that we didn’t throw our annual Oscar party. We were flying home from Sydney during the show, so if you did not get an invitation, it was not because of anything you did. I think Ellen did a good job, even though her nerves were showing, and Idina Menzel got a hysterical story for her cabaret act. Speaking of movies, we saw Grand Budapest Hotel and thought it was good, not great. I’m a big Wes Anderson fan, and this was one of my least favorite films of his — gorgeous and quirky, but not particularly funny or moving. We also rented Rush, which is boring unless you understand the obsession with car racing, which I don’t. I do not care who can drive the fastest in circles to get nowhere. Albert’s aunt Sherry and uncle Jerry came for a visit last weekend. We spent an afternoon at the Getty Villa, and it is not horrible to hang out in a beautiful Roman country house on the coast of Malibu. Admission is free and parking is $15 for as many people as you can squeeze in, so clown car it to the museum and go see some ancient art. I went to a very fun brunch at my friend William’s in Mount Washington on Sunday, and a dinner party at Gabi’s house in Studio City on Tuesday night. Thanks for the invites and the delicious food, boys! I was interrupted from writing this week by a cute guy coming door to door, asking for signatures regarding a project at The Palladium. He called me Sir several times, which I hate because it makes me feel very old. Then when I told him my email, he responded with, “Hotmail? That’s old school. My uncle has a Hotmail account.” Well isn’t that special. Please do not return to my home unless you are selling Girl Scout Cookies. Today I was interrupted by a man coming to my door from the Hollywood Forever cemetery. He was taking a neighborhood survey, and I am a fan of the cemetery, so I was happy to talk. Then the conversation took a turn from survey to sales pitch and the man asked, “Has someone near to you recently departed, or would you like some more information about our services?” Oh my God, what are the odds that someone has recently died and I’m just sitting at home with the corpse waiting for somebody to come by and help? Did something happen that I’m unaware of, that should make me start looking around my house for dead bodies? It is one thing to get brochures from Orange County retirement homes in the mail at age 44 (which I do), and quite another to have the cemetery actually come knocking on my door! We did have a large earthquake on Monday morning, so I’m a bit worried that I didn’t make it. This weeks celebrity sightings included Kathy Kinney from The Drew Carey Show, and Joel McHale, both at my gym, Josh Groban driving his car, and Beth Behrs from Two Broke Girls at Trader Joe’s. 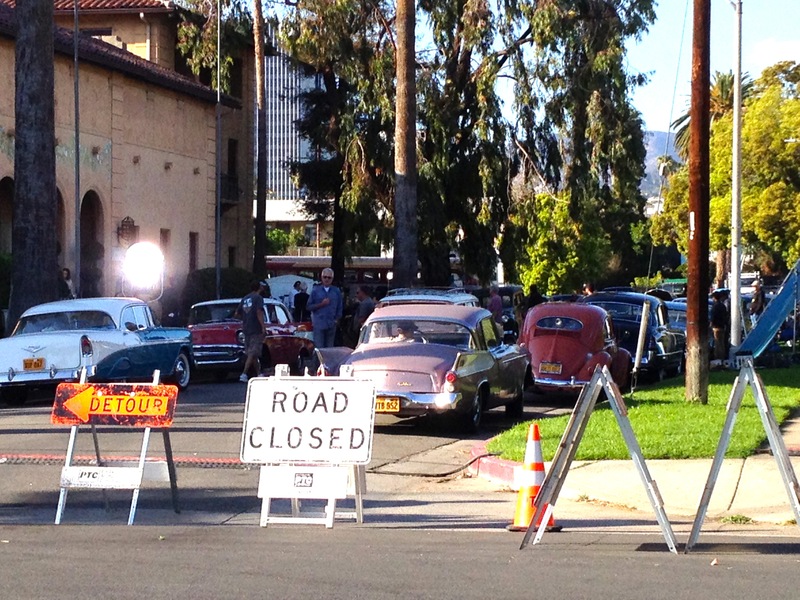 The picture (above) is from my walk to the gym this week when I passed a 50’s or 60’s film being shot. This entry was posted in Uncategorized and tagged Beth Behrs, Crimea, earthquake, Getty Villa, Grand Budapest, Hollywood Forever, Joel McHale, Josh Groban by billylambrinides. Bookmark the permalink.